These end of street shots are hard to make interesting. In the distance you can see the trees of St. Georges Street. Longmarket used to house a victorian market, that's echoed nowadays by the street market on Wednesdays and Fridays. 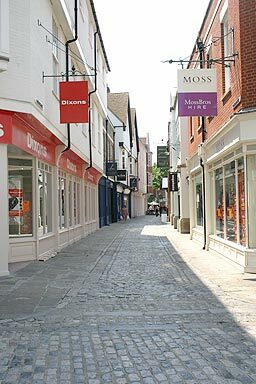 The building was bombed flat in the war and both sides of this lane have been re-developed since I started the Canterbury Tour.